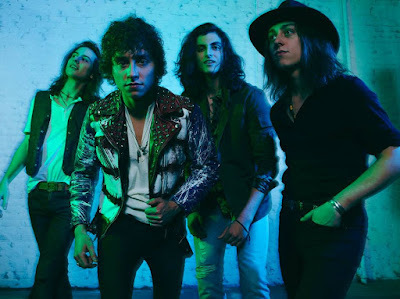 Greta Van Fleet cancelled their July 29 appearance at New York City’s Panorama Festival due to an ongoing injury issue with drummer Danny Wagner. "It is with great dismay we must announce that we will no longer be able to see your lovely faces in NY at Panorama Festival,” the band explained on social media. “Danny has been playing with injured fingers for the last two weeks, and they have not been able to heal properly. It has now reached the point where he cannot pick up a drumstick because of it. Therefore, there is no possible way for us to play today. "There's no greater joy than sharing music, and we are disappointed to miss time spent with you. We promise to make it up to our fans in NYC this year. However, it is our top priority for Danny to heal from this injury and be able to play for all of you soon." The Michigan rockers are currently on the road across North America, and are next scheduled to perform at The Agora in Cleveland, OH on July 31. Greta Van Fleet are touring behind two 2017 EP’s – “Black Smoke Rising” and “From The Fires” – and recently recorded their full length album debut for expected release later this year. Led by brothers Josh Kiszka on vocals, guitarist Jake Kiszka and bassist Sam Kiszka, the band recently earned a standing ovation from the studio audience when they performed their new single, “When The Curtain Falls”, on The Tonight Show starring Jimmy Fallon.